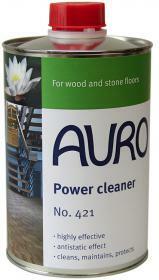 This auro power cleaner etches old wax layers, cleans surfaces thoroughly and forms a new, waferthin protective wax film. Suitable for waxed wood, parquet, cotto and cork floors. Cleaning agent for heavily soiled impregnated surfaces or surfaces treated with beeswax balsam (e.g. wood-block flooring, furniture, Cotto, cork) forms a very thin, protective wax film. Product containing wax and solvents, with good dirt dissolving power, for balsam coating, intensive cleaning power, has slight re-waxing properties.